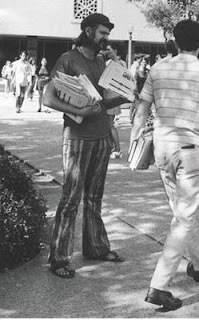 Obama File 55 Former Weatherman Terrorist and Comrade Discuss Obama-"Lenin Would Be Impressed"
Mark Rudd was a leader of the '60s mass radical organisation Students for a Democratic Society (SDS) and its terrorist splinter group-Weather Underground Organisation (WUO). Today Rudd serve on the board of the Movement for a Democratic Society (MDS). MDS is the parent body of Progressives for Obama, the leading leftist umbrella group behind Obama's presidential campaign. Progressives for Obama is designed to unite radicals behind the president elect, defend Obama from attack and "explain" Obama's positions to radicals who don't understand his subtle approach to socialism. 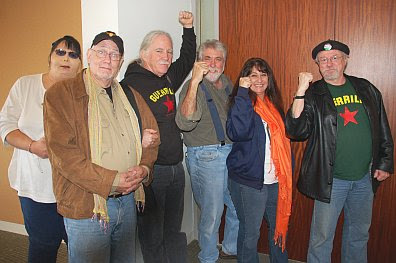 MDS unites leaders of the three major socialist organisations behind Obama-Democratic Socialists of America, Communist Party USA and Committees of Correspondence for Democracy and Socialism (CCDS). MDS also groups together many former leaders of both the SDS and the WUO. Several MDS leaders know Barack Obama personally. MDS board member Bernardine Dohrn and her husband MDS activist Bill Ayers (both former SDS and WUO leaders)helped launch Obama's political career at a 1995 gathering in their Chicago home. Ayers worked with Obama for several years and since the election has revealed that the Obama's were "family friends". Bill Ayers's long time friend, former SDS leader and MDS board member Carl Davidson also knows Obama well. Davidson, a leader of the Communist Party offshoot CCDS, met Obama as least as early as 1995 when the aspiring young politician joined the Chicago New Party. A front for Committees of Correspondence, DSA and the radical community group ACORN. the New Party endorsed Obama for his successful Illinois State Senate run. Davidson visited Obama's home and maintained a relationship with him until at least 2002. 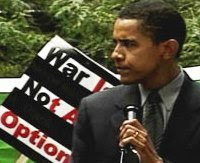 That year Davidson, former SDS member Marilyn Katz and former Communist Party front activist Don Rose organised the Chicago peace rally where Obama made his name as an opponent of the Iraq War. Mark Rudd were very close to Ayers and Dohrn during their SDS/Weathermen days. Now they all work together in the leadership of MDS. They also clearly work closely with fellow MDS board member Carl Davidson. Rudd also supports Progressives for Obama, which Davidson helped found with former SDS leader Tom Hayden and DSA leaders Barbara Ehrenreich and Bill Fletcher Jnr. It is fair to assume that Rudd has discussed Obama with the trio who know the president elect well-Ayers, Dohrn and Davidson. So if Rudd believes Obama to be a socialist committed to changing America, a shrewd Marxist tactician of whom "even Lenin would be impressed"-should he be taken at his word? 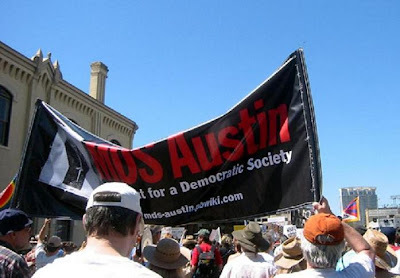 Rudd recently posted an article a radical blog, The Rag-run by Austin Texas based former SDS activist and MDS and Progressives for Obama supporter, Thorne Dreyer. The original "The Rag" was a '70s radical newspaper, also produced by Thorne Dreyer and comrades. Thorne Dreyer selling the original "Rag"
Rudd was writing for friends so he let his guard down a little. Rudd lays out his take on the Obama agenda. It is subtle, it is clever, it is most definitely socialist. Rudd explains to his wavering radical friends, that Obama is definitely on their side but must work tactically to achieve his radical goals. If you're anything like me, your inbox fills up daily with the cries and complaints of lefties. Just the mere mention of the names Hillary Clinton and Lawrence Summers alone conjure up a litany of horrendous right-wingers appointed to top level positions. Betrayal is the name of the game. * Obama is a very strategic thinker. He knew precisely what it would take to get elected and didn't blow it...But he also knew that what he said had to basically play to the center to not be run over by the press, the Republicans, scare centrist and cross-over voters away. He made it. So he has a narrow mandate for change, without any direction specified. What he's doing now is moving on the most popular issues -- the environment, health care, and the economy. He'll be progressive on the environment because that has broad popular support; health care will be extended to children, then made universal, but the medical, pharmaceutical, and insurance corporations will stay in place...the economic agenda will stress stimulation from the bottom sometimes and handouts to the top at other times. It will be pragmatic...On foreign policy and the wars and the use of the military there will be no change at all. That's what keeping Gates at the Pentagon and Clinton at State and not prosecuting the torturers is saying. And never, never threaten the military budget. That will unite a huge majority of congress against him. And I agree with this strategy. Anything else will court sure defeat. Move on the stuff you can to a small but significant extent, gain support and confidence. Leave the military alone because they're way too powerful. For now, until enough momentum is raised. By the second or third year of this recession, when stimulus is needed at the bottom, people may begin to discuss cutting the military budget if security is being increased through diplomacy and application of nascent international law. * Obama plays basketball. I'm not much of an athlete, barely know the game, but one thing I do know is that you have to be able to look like you're doing one thing but do another. That's why all these conservative appointments are important: the strategy is feint to the right, move left. Any other strategy invites sure defeat. It would be stupid to do otherwise in this environment. * Look to the second level appointments. There's a whole govt. in waiting that Podesta has at the Center for American Progress. They're mostly progressives, I'm told (except in military and foreign policy). Cheney was extremely effective at controlling policy by putting his people in at second-level positions. * Read Obama's first book, "Dreams from My Father." 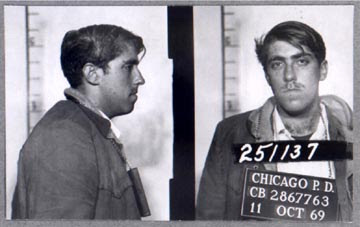 The second section is the story of his three years doing community organizing in Chicago. It's some of the best writing on organizing I've ever seen. That's all it's about, the core of the book. Obama learned many lessons of strategy and patience. Then read the first section, on his family and growing up in Hawaii and Indonesia. No other president has ever had such intimate experience with class and race. The final section is about his trip to Kenya. No other president has ever had an understanding of not only race, but colonialism and neo-colonialism, even using the terms. It's the whole story he tells of his African family and especially his father, a victim of neo-colonialism. As was his step-father in Indonesia. This is no stupid guy...Had any of the stupid Republicans read his books, they never could have said, "We don't know who this guy is." You know every thought he's ever had. Our job now is to organize both inside and outside the Demo party. There's already a big battle in the Demo party at every level. Here in the New Mexico State Legislature, the progressives are challenging the conservative Dems for leadership; the same is true in Congress. If you can't stand to work in the party, work on putting mass pressure on issues such as healthcare and jobs and the war from outside. Here's my mantra: "Let's put this country on our shoulders and get to work." How blatant is that? "And I agree with this strategy...Leave the military alone because they're way too powerful. For now, until enough momentum is raised...you have to be able to look like you're doing one thing but do another. That's why all these conservative appointments are important: the strategy is feint to the right, move left...Look to the second level appointments. There's a whole govt. in waiting that Podesta has at the Center for American Progress. They're mostly progressives..."
Is this a recipe for stealth socialism, or what! Another The Rag Blog contributor, Austin activist Jeff Jones (not to be confused with the former Weatherman and MDS board member of the same name)backed up Mark Rudd's analysis and added some telling remarks of his own. Jeff Jones wrote inThe Rag Blog November 29th. I agree with Mark Rudd's perceptive article Let's Get Smart About Obama in The Rag Blog. The writing style of Audacity of Hope reveals how complex and perceptive Obama is... He does not interpret reality in black and white terms: he is the nation's first post-modern president. All of this leads me to the same conclusion reached by Mark Rudd: this guy is really SMART. He is setting Hillary Clinton up to be the public face of his effort to end the Iraq war. He is going to sucessfully extort green concessions from Detroit. He will convince Congress to pass a major stimulus package that will lay the foundation for the development of an alternative energy manufacturing industry. He will do something to help reduce housing foreclosures. He will let the Bush tax cuts for the wealthy expire. These various initiatives, which will collectively set the nation on a path towards energy independence, ending the war and redistributing financial resources downward, are presented as unconnected pieces of legislation but actually they are interlocking components of Obama's coherent multi-layered agenda. His centrist appointments are a smokescreen; they co-opt the moderate center, but he's still the commander in chief. Even Lenin would be impressed! What's that..."redistributing financial resources downward...Obama's coherent multi-layered agenda...centrist appointments are a smokescreen...Lenin would be impressed"? Does that sound like the kind of "change" that over 60 million Americans voted for? Is that your idea of "democracy"? "This is no stupid guy"
Obama proposes nothing new, he has no new ideas. He is a clever, charismatic liar. Perhaps in this much we agree. All of Obama's ideas have been tried before. Building useless infrastructure to replace gainful employment failed before. But Obama stupidly proposes to build unneeded infrastructure again. If Obama is trying to sabotage the United States, perhaps he is as smart as you say. But his plan to resurrect the economy by WPA is stupid. As is every "economic" plan he dreams up, which all come from his 1850s vintage delusion of the nature of man. Even after "affordable mortgages" nearly has destroyed the economies of the world, Obama does not begin to suspect that government can't manage wealth or asssets, and must be constitutionally constrained from doing so. Even after capitalism and free markets have proven vastly superior economic solutions, Obama still clings to the failed socialist system like an overgrown child to a crib-blanket. We cannot afford to try these stupid ideas again. Just love those clenched and raised fists on those aging marxists. My they get exactly what they deserve one day. One thing these aging radicals will never admit is the abysmal failure of every single one of the items on their agenda; they will never admit to being wrong or being responsible for all the deaths (100 million & counting) directly attributed to the implementation of their ideology over the past century. I fear they are so narcissistic & nihilistic that the truth would never have an impact on their idiocy! Yesterday's flower children are today's blooming idiots! Gramsci-A Coward At the End?